For anniversary dinner I decided to go with a more French-inspired approach. 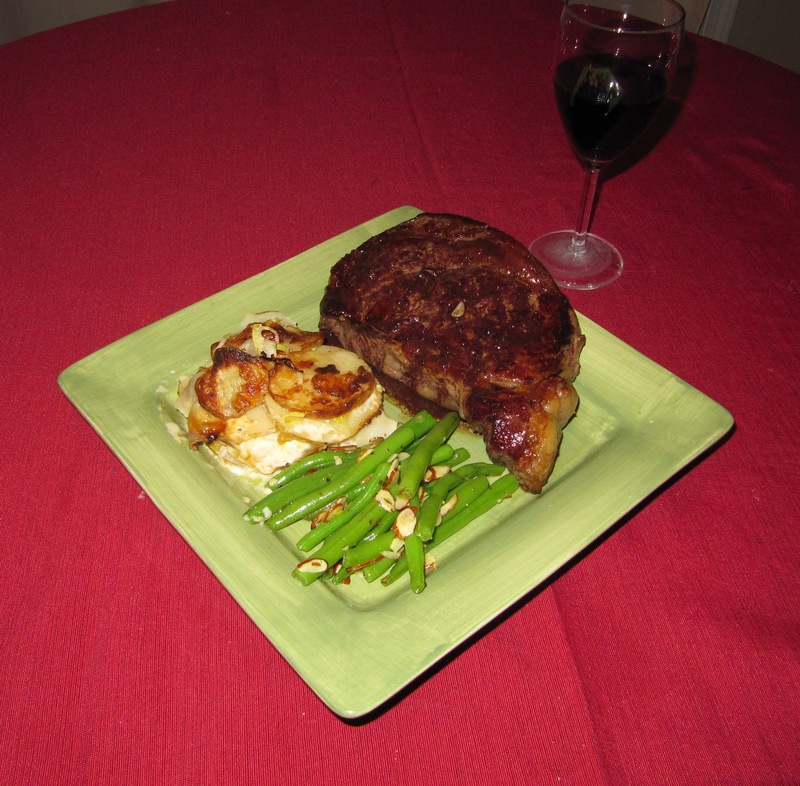 The main course was a dry aged ribeye steak, potato leek gratin, and green beans with almonds. For dessert: classic creme brulee. I began with the gratin because this took longest to make. 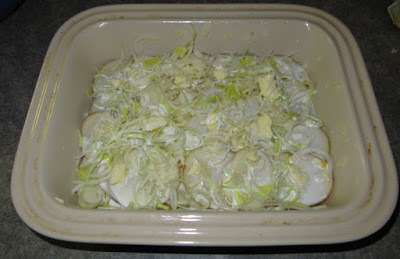 I thinly sliced potatoes and leek and began to layer these in a buttered casserole. Each layer consisted of potatoes, leeks, minced garlic, butter, gruyere cheese, and heavy cream. I continued this until i had about 8 layers. 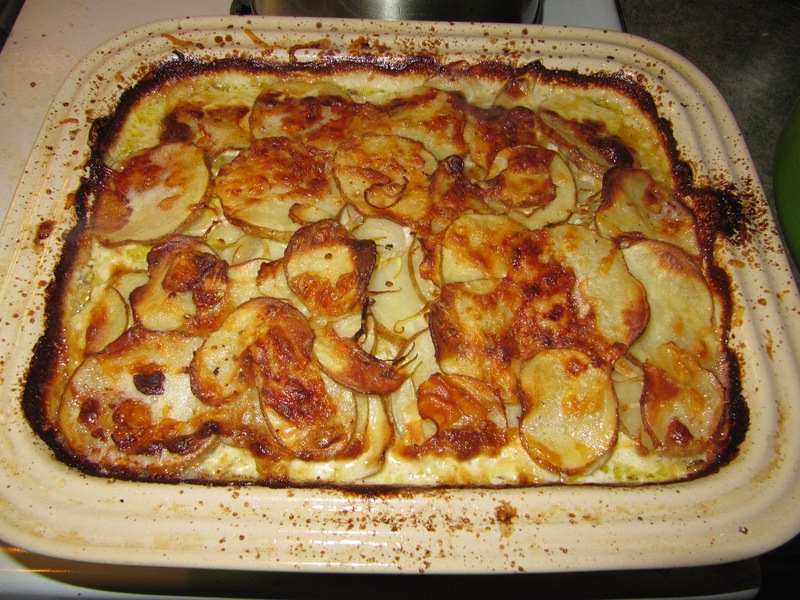 I cooked the gratin for about an hour and a half until the top was crispy and golden brown. 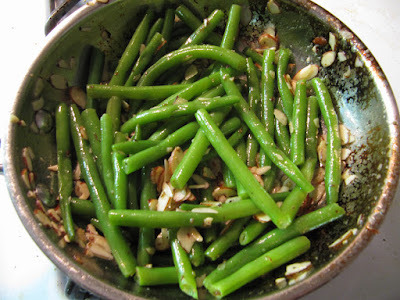 The second side are green beans with almonds. I first blanched green beans in boiling water for a few minutes and then tossed these in a pan with butter, garlic and sliced almonds. Finally, the star of the dish is a dry aged ribeye steak. The ribeye was prepared very simply by searing the steak in an extremely hot cast iron skillet on both sides then placing in an oven for a few minutes until medium rare. 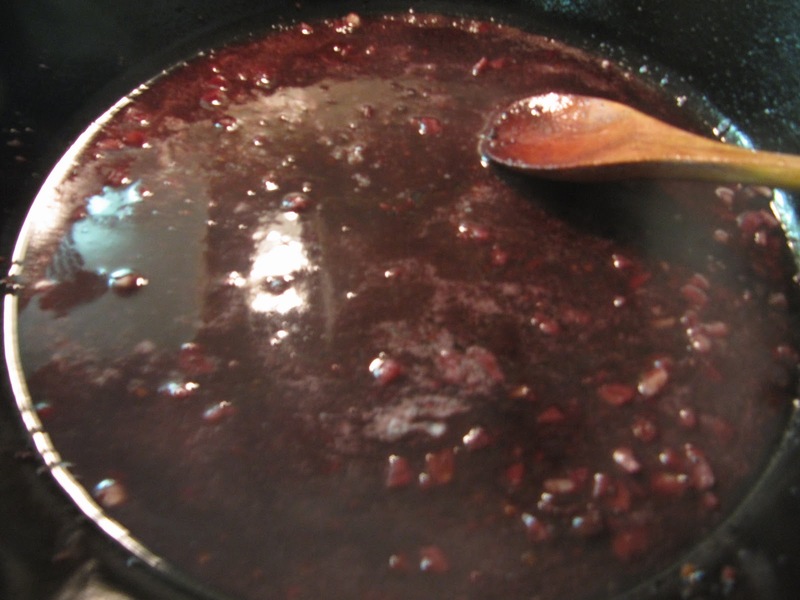 I removed the steaks from the skillet and created a pan sauce by adding some garlic to the pan and then deglazing with a bit of red wine. I added a good deal of pepper, reduced the wine to half and added a bit of butter for richness. The dinner went over very well, the steak was cooked perfectly, the green beans were crisp, and the leeks melted into the gratin. I was very excited to make dessert because I decided to splurge and purchased fresh vanilla beans. 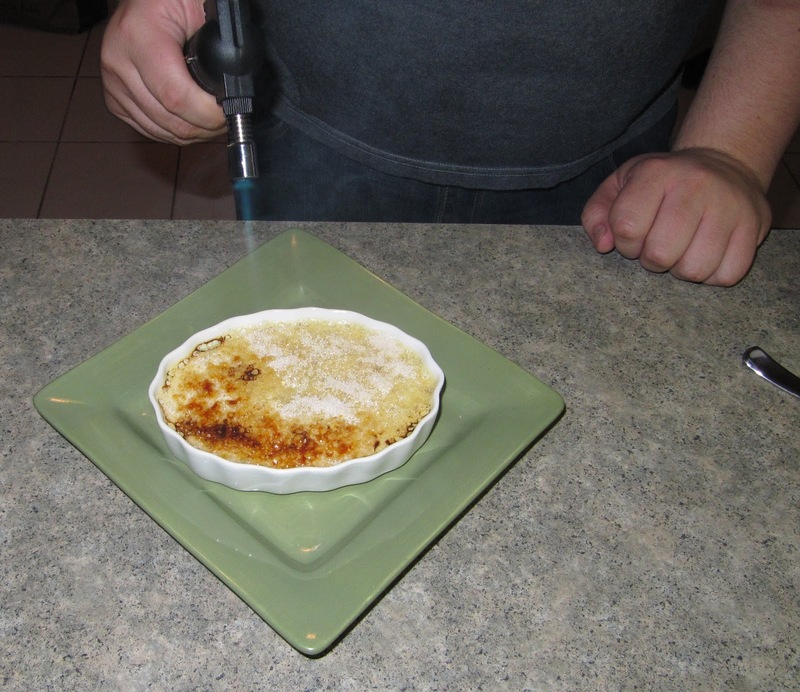 I also purchased a kitchen torch for the express purpose of creating the sugar crust for the brulee. 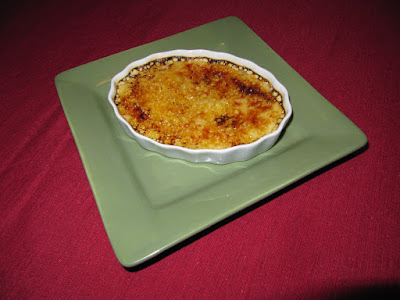 To create the brulee I split the vanilla bean in half and simmered it in heavy cream. In the meantime I whisked egg yolks with sugar until creamy. I added the heavy cream to the egg a bit at a time making sure not to scramble the yolks. I placed the custard mixture into ramekins and baked in the oven in a water bath until the custard set. To create the sugar crust, I sprinkled sugar over the top of the cooked custard and used a torch to brulee the sugar. Dessert came out well. The custard was perfectly creamy and the fresh vanilla added a complex woody flavor. The crust was crunchy and contrasted beautifully with the smooth custard. Dinner overall was very memorable, for many reasons. I am very proud that I was able to put together a romantic French meal, and I'm looking forward to many more. O.M.G. I'm so happy for you two!